The latest iPhones and iPads from Apple can natively play 4K videos at 60 FPS. That means, you can take full advantage of the retina display and enjoy one of the best 4K experiences possible on mobile devices right now. And with a sufficiently fast Internet connection, you can even stream 4K videos online, which brings us to YouTube. It’s been a while since YouTube started supporting 4K 60 FPS video uploads. Ever since, there have been numerous 4K videos uploaded on the platform. And it’s quite easy to stumble upon one of those beautiful videos; all you have to do is search for the word “4K”. But here’s the catch: Unless you’re streaming on a computer, it is unlikely that you’ll be able to select the “2160p (4K)” option. 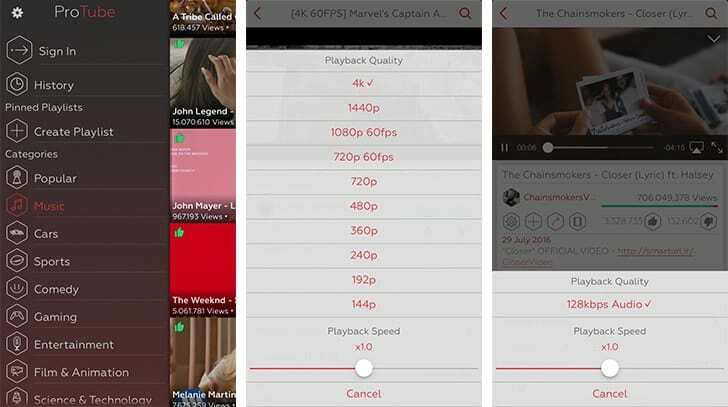 On most mobile devices, streaming quality is restricted to a maximum of 1080p; even 720p on some. There may be a few valid reasons behind such restrictions. Even today, many of the smartphones and tablets available in the market just aren’t powerful enough to render 4K quality videos on the fly. Moreover, streaming videos in 4K quality consumes a lot of bandwidth because of their relatively large size. Connection speed is another important factor in determining a seamless 4K experience. But even if you have ticked all of the boxes, the official YouTube iOS app will not allow you to stream in 2160p (4K), let alone at 60 FPS; which is why we have to resort to a third party app to help us do so. ProTube for YouTube is a third party YouTube app that allows you to play videos in full quality, including 4K and 60 FPS, wherever available. Its sleek, lightweight design and the flurry of available features may even persuade you to ditch the official app. 4K 60 FPS video streaming support is not the only feature that sets it apart from other third party YouTube players available on the App Store. YouTube often serves as an alternative music streaming service, especially in areas where services like Spotify aren’t available. Unlike Spotify, it does not have any geo-restrictions. And it is in fact one of the largest (official as well as unofficial) music video repositories online. Yet, YouTube streams videos, which does not make it a fair competitor among other music streaming services. ProTube’s additional features might make the comparison valid and fair. The app allows you to play videos in audio-only mode, making quality audio streaming from YouTube possible on low bandwidth usage. It even supports background playback, a highly demanding feature which is yet to arrive in the official YouTube app. With background playback, you can continue listening to tracks on ProTube, even when you switch to a different app, or lock your iOS device. With audio-only and background playback, ProTube brings the best experiences of a typical on-demand music streaming service, to any iPhone or iPad user. It can even play videos that are blocked for mobile devices by default. Apart from these features, ProTube lets you do almost everything that you can do with the official YouTube app, and much more. The $3.99 price tag on the product is a bit high, but might be worth it considering the features it brings to the table. ProTube gives you a YouTube experience unlike any other app. Let us know what you think of the app in the comments below.